Did you know that the corner of 37th and Pflanz marks an important Supreme Court case and a turning point for civil rights in America? Louisville (along with many other cities) had ordinances that forbade blacks from living and owning property in areas which were majority white, and vice versa. The 1917 Supreme Court case, "Buchanan v. Warley" struck those ordinances down across the nation. A historical marker will be dedicated on 11/29 @ 1pm at the corner of 37th and Pflanz Ave to mark an important piece of Portland's and America's history. The month of Halloween, Kentucky Shakespeare presents Shakespeare's bloodiest thriller, a gripping tale of horror in Louisville Visual Art's studio warehouse. Violent and experimental, TITUS was the smash hit of Shakespeare's early career and is written with a ghoulish energy he was never to repeat elsewhere. Join us for this sordid tale of revenge and political turmoil. This is a 7-part Instagram series on the US Marine Hospital, authored by Danny Seim. Enjoy! By the 1840s, steamboats dominated river traffic and were the major factor in the growth and development of industry. The boatmen served by the hospital worked difficult and dangerous jobs. Injuries due to engine or boiler explosions, wrecks, collisions with river snags and freight handling were common dangers. Exposure to extremes of temperature, from the sub-tropic heat of the Mississippi delta to frigid Great Lakes, claimed victims. Diseases affecting the boatmen included yellow fever, cholera, smallpox and malaria. While docked in the rough port towns of the time, violence, alcoholism and social diseases sent many boatmen to the marine hospitals. In the early days, 20 cents a month was withheld from their salaries to pay the boatmen’s share of their healthcare in marine hospitals, with the federal government also providing support. This was the first example of pre-paid health insurance in American history. All classifications of river workers were eligible for treatment. Every mariner, including pilots, captains, cooks, pursers, engineers, stevedores, roustabouts and deckhands, were eligible for treatment and care. It is estimated that one-third of the patients were African Americans. The Marine Hospital Service was the genesis of America’s modern health care system and is responsible for major improvements in research, hygiene and science-based medical treatment. The building was designed by architectRobert Mills - a protégé of Thomas Jefferson - who designed the Washington Monument and several other prominent structures. It was a cutting-edge facility in the day, with indoor plumbing and an air circulation system that helped prevent infections. Fresh air was as an important factor in the patient's recovery as the view of the Ohio River was. Large sleeping porches flank each floor of the hospital on both the front and back of the building. Many old photos exist of bedridden patients being attended to by the medical staff on these outdoor decks. Nowadays, the view of river has been replaced by the view of I-64 cutting across the landscape. It's an unfortunate sign of the times, but it gives the hospital the distinction of being one of the first things motorists see when traveling into Louisville. Here's a view of modern traffic through yesteryear's ornate wrought-iron railing. "The feature of the hospital which more than anything else reminds me of a ship is the cupola, which greatly resembles the pilothouse of a steamboat. It is made nearly entirely out of glass, and commands a magnificent view of the river and the city. When an old boatman becomes convalescent after a long illness, he takes great pleasure in climbing the steps to this tower and watching the movements of the boats on the river. Some of them have been known to sit there for days, dreaming, smoking and thinking..."
As with the outdoor decks and porches, the river scenery is obscured by the interstate these days. Still, it's a spectacular panoramic view nonetheless. The cupola and the hardwood spiral staircase leading up to it were completely restored a decade ago. Light pours in through the antique windows, and it's easy to imagine feeling rehabilitated up there. The medical term "resident" originally referred to young physicians who completed their studies while living in America's early hospitals. From 1953 until 1974, the Marine Hospital was a home for local medical students who received room, board and small stipends to work with patients in the same building. The old resident bedrooms make up much of the hospital's second floor. Here is the current state of one of the many small bathrooms. Recognizing the need for a more modern facility and as an economic stimulus to provide jobs during the Great Depression, a new 100-bed facility was built behind the original Marine Hospital in 1933. 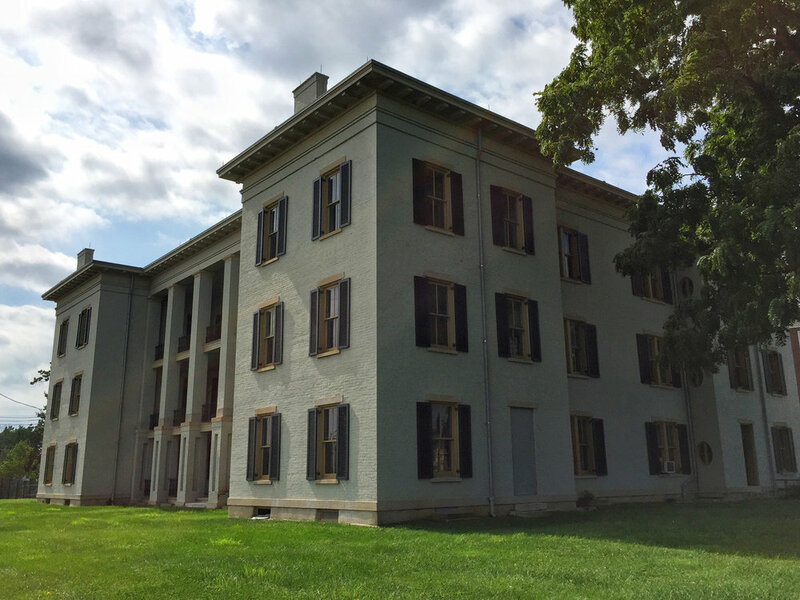 The old hospital was converted into quarters for nurses, medical officers and pharmacists. When constructing the new facility - now known as Portland Family Health Center - a new boiler system serving both old and new hospitals was installed in the basement of the Marine Hospital. This decision helped preserve the original building by extending its usefulness. This is the boiler room. Heavy sliding doors on two of the walls helped insulate the passages to the morgue, which was stocked weekly with bricks of ice to keep the corpses from decomposing. The basement morgue is the stuff horror film sets are made of. The stale air is thick with the weight of not only the decaying 25,000 square foot structure above, but also the weight of knowing what this specific area was once used for. The ceiling feels much lower than it actually is. All the light bulbs have long been either broken or burned out, and the only dim illumination comes from small windows high along the perimeter walls. The vast majority of the morgue is kept in perpetual darkness. Dust particles flicker wildly when a flashlight is turned on, and archaic medical equipment appears out of nowhere in the beam. Regardless of this stereotypical haunted house setting, the atmosphere is more solemn than scary. Most of the patients who wound up down here came to the hospital hoping to eventually walk out the front doors on their own accord. Despite the expert care provided above, they somehow ended up below. In 1997, the Marine Hospital was granted status as a National Historic Landmark, and in 2003, it was awarded "Save America's Treasures" status by the National Parks Service. The extensive exterior renovations began in 2004, returning the weathered, crumbling brick to its original painted grey, and reattaching the massive window shutters with their original antique hinges. A new roof was installed by the same workers who renovated the nearby McAlpine Locks, in 2009. Here is one of the ground floor rooms that was restored and decorated to look like it did over a century ago, complete with a display case of antique whiskey bottles that were used as an anesthetic back in the day. Because the outside is restored, Family Health Centers Executive Director Bill Wagner says many people believe the inside is in good shape, too. "Little do they know, it's empty," said Wagner. Though several proposals have been submitted to the general assembly, Wagner says attempts to make the inside look as good as the outside have failed. "Up until now we just haven't been fortunate enough to raise the five to six million dollars we need to refinish the interior," said Wagner. The latest proposal calls for a collaboration between Family Health Centers, JCTC and U of L to create a Center for Health Education and Training. However, Wagner says many private donors want to see public support first. "We're disappointed. We thought the building would be restored to use by now." He says they are more than willing to consider other proposals if interest is shown. Good Shepherd Catholic Parish http://goodshepherdchurch.us/ currently occupies the church on Rudd Avenue between 35th and 36th Streets. This church was originally Notre Dame du Port, the Church of Our Lady. This small Portland parish has overcome multiple instances of flood damage, as in the 1939 flood shown in the photo. In June 2009, Good Shepherd was formed from the merger of Our Lady, St. Cecilia, and St. Anthony Parishes. In 1971 the consolidated Community Catholic School was formed by combining Our Lady, St. Cecilia, and St. Anthony schools, and was in operation until 2003. After the school closed, the Community Catholic Center http://communitycatholiccenter.org/ was formed to raise funds to provide Catholic education for the children in Portland. The second photo shows Rudd Avenue in 1930, just north of Western Parkway (which is now called Northwestern Parkway). A trolley on street car tracks can be seen in the middle of the road, and Our Lady Church can be seen to the left. ULPA CS 164420, Caufield & Shook Collection, Photographic Archives, University of Louisville, Louisville, Kentucky. http://digital.library.louisville.edu/cdm/ref/collection/cs/id/760">Flooded church, Louisville, Kentucky, 1939. ULPA MSD.045.009, Metropolitan Sewer Collection, 1981.03, Photographic Archives, University of Louisville, Louisville, Kentucky. The Portland Investment Initiative (PII) announced it closed on 2.5 acres on Rowan and 14th Street in the East Portland Warehouse District, specifically the 13,000 square feet "Portland Station Terminal Building. The purchase includes a 2,500 SF service garage, presently operated by Nic Transport. Historically, this site has always featured a railroad station. On the 1882 Sanborn Map it shows it as the "LNA&C" (Louisville, New Albany, and Chicago) Freight Terminal. (hppt://kdl.kyvl.org/catalog/xtywpz51gn1p_39) In the 50s, Portland Station was owned by the "C I & L" Railway Co. (Chicago, Indianapolis, and Louisville Railway Company) and operated as a terminal freight office. More recently, in the '50's, Portland Station was owned by C I & L Railway Co.(Chicago, Indianapolis, and Louisville Railway Company) and operated as a terminal freight office, though some passengers were also known to use the station. In the '60s it became Monon Railroad Freight Terminal (Monon featured the classic "Thoroughbred" passenger line that ceased in late 1967 with the decline in passenger travel nationwide). In the 70s and 80s the Station became a trucking logistics hub for Banner Transfer Truck Lines. Partners include Gill Holland, realtor Matt Gilles (who will be the person in charge of the leasing and development), dentist and real estate investor Ali Navigar, Shine Contracting principal Gregg Rochman, Nashville-based social entrepreneur Ryan Brown, Greg Brown (owner of Ford Lincoln, Franklin, TN). "We have lots of exciting ideas for this historic, strategic property which we look forward to rolling out over the coming months," said Holland. Jehri was born and raised here in Portland, in a house directly across the street from the immaculate, late 19th century cottage where he and his partner Jayson have made their home since 2010. This house was Jehri's beloved Mema's place before she passed. He speaks at length about how brilliant his grandmother's blue eyes were, his voice cracking as he describes her on her deathbed, how those eyes were fixed upon his even after she couldn't see him anymore and he accepted that it was only a matter of time. We talk for over an hour on Jehri's porch swing. He gets up multiple times to adjust his outdoor air conditioner to make sure I'm comfortable. "The only problem with having this thing outside is that its exhaust was starting to kill the plants behind it. I had to fix that". He's disarmingly sweet and effortlessly hilarious. His deck is a masterpiece of flowers, benches and carefully arranged pillows. The décor is all patriotic, mostly left over from July 4th. It's August 1st now and his fingernails are still freshly painted red, white and blue. It must have been an amazing party, I think to myself. "It was an amazing party", he says proudly on cue, "though we had to set up a tent next to my 'hoarder's garage' where I keep all my decorations, because it was supposed to rain". We step off his front porch onto Northwestern Parkway - the most beautiful street in the West End, if not all of Louisville - and naturally, he knows everyone. Cars stop to say hello and to blow kisses his way. Neighbors come outside to chat when they see him approaching. He points to every house in both directions as far as I can see and gives me an exhaustive family history of each residence, only pausing to introduce me to people and to reference architectural photos he's taken on his phone. He's rattling off names, events and personal memories so fast that I've given up taking notes. All I can do is listen and nod in amazement. This is a man who works Monday through Friday at the American Printing House for the Blind, and then spends his weekend as a manager at the local Dairy Queen. 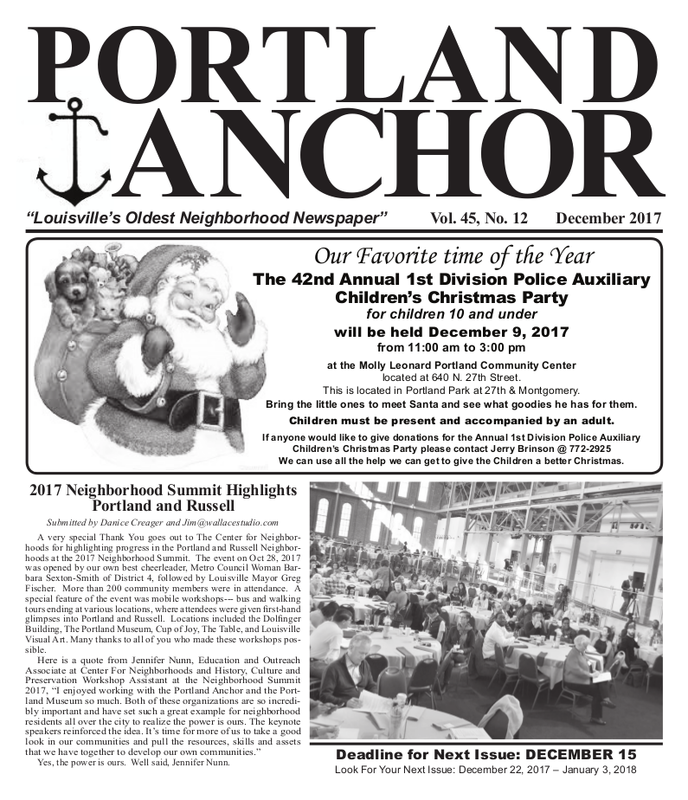 He's served as treasurer for the Portland Now, Incorporated (PNI) neighborhood committee for the past three years, and has also done extensive volunteer work for the Portland Art & Heritage Fair. How he has any energy left over for community work is beyond me. The monthly PNI meetings are always a productive atmosphere. There's usually at least one person presenting a new renovation project or proposing a neighborhood improvement idea. Does all this talk of revitalization worry a third-generation Portland resident like Jehri? "It bothers some people around here, but not me. The train is here. This is our chance. We need to get aboard it now or realize it may never come back." He tells me, "People ask if I'm scared to live in Portland. I'm not scared. I mean, I used to run these streets barefoot as a kid". He says this while gesturing towards the sidewalk in front of his childhood home, "It used to look a lot better". The gutters have fallen off now, the siding looks spongy and it’s pretty clearly abandoned. He holds up his phone to show me a sepia photo of his father sitting proudly on the hood of a Brady Bunch-era station wagon directly in front of the house before me. I squint, and the smartphone falls like a puzzle piece into the scenery behind it. It's now a cute little home with a fresh coat of paint and a manicured yard. Jehri moves his hand and the illusion is broken; the house snaps back to its dilapidated state, the cool guy perched on the cool car fading into memory. This interview is part of an ongoing series called Our Portland Portraits. 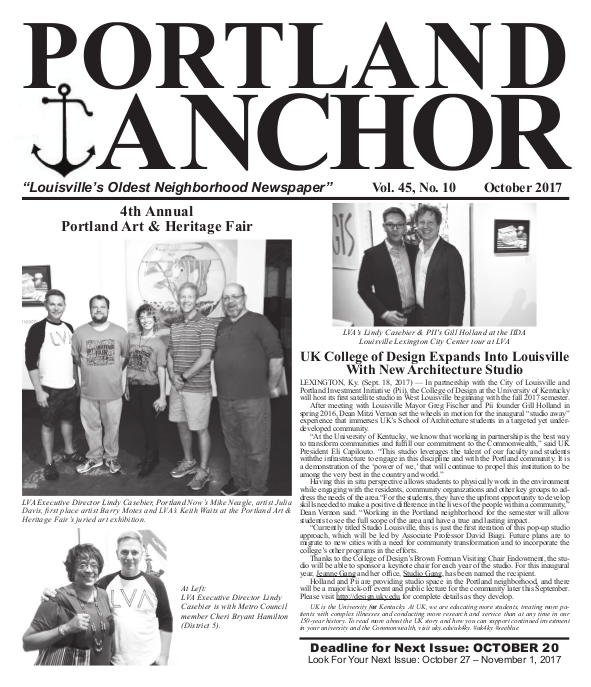 Google "Portland Louisville Change" and you’ll find a bunch of articles focusing on the external. Yes, there’s been a lot of talk about this neighborhood lately. Yes, several powerful key players have taken a recent interest in our little bend in the river. And yes, there’s a lot that needs to be done. There will always be skeptics, but signs of positive change are blossoming all over town. Dig a little deeper and you’ll find Portland’s renaissance has sturdy internal roots. Gary Watrous has played a major role in fostering local pride and growth since moving to Portland nearly 40 years ago. An architect by trade, Gary is a prominent member of at least a half-dozen neighborhood committees, including a demanding role as secretary of Portland Now, Incorporated. Gary also donates his expertise to more widespread initiatives such as Solar Over Louisville and the Sierra Club. Somehow, he still occasionally finds time to sail his small sailboat with his wife Judy on Deam Lake in Indiana. I met him at his home office on West Main Street to ask him a few questions about his life. What are some of your earliest childhood memories? I was born in New York City, but soon after my family moved to my grandparent's farm near Oswego, New York to raise chickens. I remember my father waiting to get drafted. He’d go to the mailbox every day, but the notice never came. He guessed the draft board lost his address so he never went to war. Where did your desire to become an architect come from? My father was an amateur architect; he built our house and other houses in the neighborhood. My whole family is artistically inclined. Both my mother and father were landscape painters. My sister is a house museum curator. My brother retired from being a psychologist and started painting. My younger brother taught art for decades in the public school system. Sounds like quite a well of inspiration. Yes, it was. My father took a graphic design job at General Electric in Schenectady, New York, and for $100, he bought a share in a 250-acre farm in the hills. On this farm land, everyone built their own house. I was raised in a community of do-it-yourselfers, sort of a Tom Sawyer-like existence growing up. The first actual city I lived in was in Germany, after I got a degree in the German language from Hamilton College in New York. After that, I got a master's degree in architecture at Yale. What brought you to Kentucky? I passed my exams at Yale and then got a job teaching at the University of Kentucky. It was there where I met Judy Schroeder. We got married a year later. It was love at first sight. Where did you go after Lexington? First, we moved to Philadelphia. I got a job working for a famous architect named Louis Kahn. Judy and I were involved with neighborhood building work. Judy was trained as a community organizer and I was always interested in neighborhood culture, having grown up in a do-it-yourself community. We lived in several hippie co-ops in Philadelphia while I renovated old houses. We had two of our three children there. Judy’s parents wined and dined us to come to Louisville, saying it was a much better place to raise children. Judy is a third-generation Portland resident. Her grandmother spent her entire life here, and her mother lived here until she got married. We were looking for a similar working-class neighborhood as the one we lived in, in Philadelphia. Portland seemed like the right fit for us. So, we moved here in 1978. I got a job at The Preservation Alliance, doing an architectural survey of West Louisville, and then later as director of Portland Housing Program. We rented an old house on Northwestern Parkway, a yellow brick antebellum mansion. We had an apartment on the second floor. The owner of the house was Mr. Fertig, a bricklayer, who lived with his wife on the first floor. He told stories of looking for work during The Great Depression. He would stow away on the back of the brick trucks that passed through the neighborhood and worked wherever their destination was. I’ve lived in a lot of different places. I’ve traveled a lot. My passport says I’ve been to about 40 different countries. Going from east coast culture to Kentucky culture sort of feels like going to a different country. Portland feels like living in another country, even though I’ve lived in Germany for two years. I see Portland as a working class neighborhood. I like the people -- good-hearted, down-to-earth people. Real straightforward. Portland is really just a little country town, just like it was in 1835. And that’s because people move from the country of Southern Indiana and Kentucky to live here. I think it’s the most diverse neighborhood in all of Louisville. It’s very financially, ethnically and racially diverse. It’s an interesting place to live. Got any favorite neighborhood spots? I like the river a lot. I always gravitate to cities that have a significant geographic feature, like an ocean or a river. I’m a cancer, so I’m a water sign. I guess my favorite place, even though it’s not technically in Portland, are the fossil beds near the Falls of the Ohio. I go over there quite a bit. I also like the McAlpine Locks. It’s one of the more interesting places on this side of the Ohio to witness human interaction with the river. They put 250 million dollars worth of improvement into it several years ago, adding a new lock and a visitor center. The workers also put two million dollars into the roof repair of the US Marine Hospital during the process. Another place I like a lot is my backyard. Well, let’s see.. Our three children were raised in Portland. It always worked out well for our family to live in a duplex, because I converted half of the home into my office and we lived in the other half. I always encourage younger couples to buy a duplex. You can live on one floor, rent out the upstairs and share the backyard. Your tenants can cover the mortgage and you can live rent-free.